It sure has been a great week for in-form stallion Redente, a resident of Benalla’s Riverbank Farm. Doing the job despite limited opportunities, the unraced but extremely well bred son of Redoute’s Choice and the Group One winning mare Stella Cadente is proving quite the upgrade and the best is still to come. Kicking off Redente’s recent winning run was Flying Ferret, a dominant first up winner at Albury last Saturday. The Russell Osborne trained four-year-old was having his first run since January (back from surgery for knee chips) and is bound to derive great benefit from the run. Fast forward to Monday and Gangstar’s Curse was a warmly supported favourite making his debut at Wodonga. The Sylvia Thompson trained bay proved a class above his rivals – giving a great kick at the turn and racing away to win by an impressive 4 1/4 lengths. 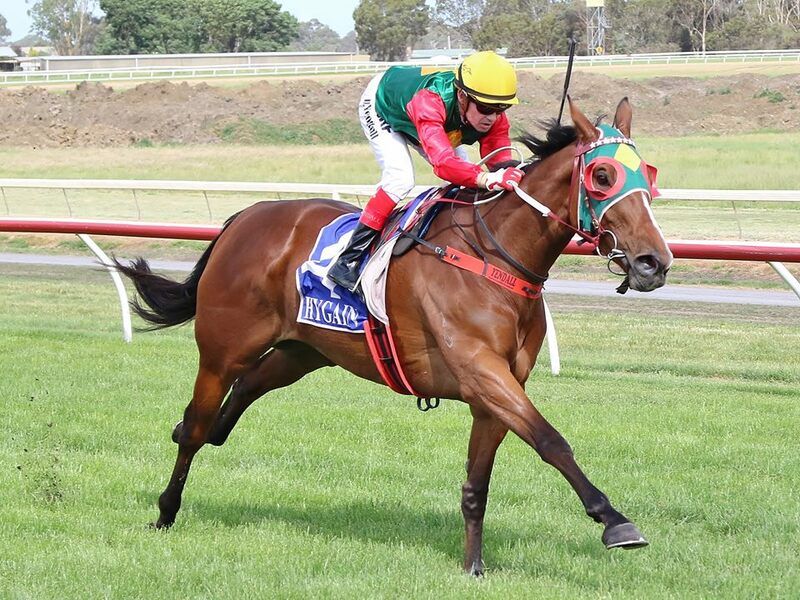 Gangstar’s Curse’s stable mate Aunty Elsie was another Redente winner this week, at Tatura on Tuesday, winning with a fair bit in hand at Tatura despite racing a little greenly. Recording her second success from her last three starts and her fourth overall, the four-year-old was having her first start at the 1400m. And on Wednesday there were another two winners for Redente, Stella The Boss at Bendigo and Honest John at Mount Gambier. Giving them a start after a slow beginning, Stella The Boss did a little wrong at only her second outing but she was strong to the line. And it was another new winner for Redente with Honest John’s success at Mount Gambier, that lightly raced chestnut too fast for his rivals in a 900m maiden. Another Redente to watch out for is Billabong Babe, a three-year-old who bolted in with her maiden at Leeton before stepping up to city class and running a gallant second to the speedy Miss Idyllic at Moonee Valley on Cox Plate weekend. “Redente is a lovely horse who is really stamping his progeny,” said Riverbank’s Russell Osborne. Hailing from the prolific black-type family of Bint Marscay, Bollinger, Benicio, Ortensia and Kenny’s Best Pal, Redente was bred by Nagambie’s famed Wood Nook Farm but unraced due to a foot injury incurred as a yearling. A unique Victorian breeding quadrella! Imagine stud principal Neville Murdoch’s surprise when maiden mare Kissed Again was scanned last week having been served by Larneuk Stud‘s exciting first season stallion Cluster. On display were not twins, they are not uncommon. And not even triplets – but this was an extraordinary set of quads! “(Goulburn Valley Equine Vet) Dr Angus McKinnon said he had not seen a case of a quadruple pregnancy in years,” Murdoch said. Already 42 mares have been served and Cluster has also had numerous sets of twin pregnancies, taking his to his new career with vigour and enthusiasm. An eye-catching son of Fastnet Rock who himself has maintained high fertility figures throughout his career, Cluster was a barnstorming winner of the Group 3 Theo Marks Quality over 1400m. 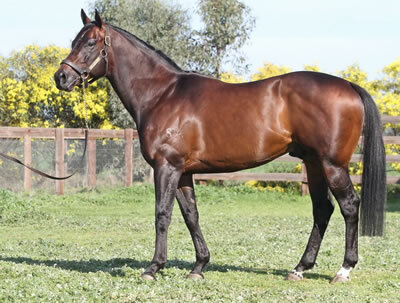 His sire is already doing a great job as a sire of sires with Stryker, Wanted and Hinchinbrook all siring stakes winners with the latter’s son Press Statement a dominant winner of the Caulfield Guineas. Describing Cluster as “an imposing individual” with “great character,” Murdoch could not be happier with the start his handsome bay has made to his stud career. And he is confident that he will suit a wide range of mares, much taken by the depth of his pedigree. Cluster stands at a debut fee of $6600 (incl gst). For further information contact Neville Murdoch at Larneuk Stud on 0418 105 706. A pair of Victorian stallion owners are generously donating service fees to three locally-based sires for the very special cause of Joey Lynch. Joey is a 23-year-old Melbourne man, and son of renowned racing scribe Michael Lynch, who has been battling Hodgkins Lymphoma disease for the past seven years. He is seeking a potential lifeline by trying to raise $800,000 to fund treatment for his debilitating disease in the US. Anacheeva was a champion Australian three year old miler of his generation winning the stallion making Group 1 Caulfield Guineas. His first progeny will be hitting the track this season. Unencumbered was a brilliant winner of the Magic Millions 2yo Classic and is a son of the champion Testa Rossa. He started his stud career in 2014. Stryker is a group winning son of Fastnet Rock whose progeny have already hit the track and have won and proven themselves at black type level. Peter Liston said on behalf of the Liston family and their stallion partners Gary Johnson and Richard Pegum they considered it a privilege to be able to support Joey. The service fees will be offered in a silent auction format. Service fees can be used either this current season or in the 2016 season, with a free return if required and will be subject to the stallion farm’s service agreement. Anyone wishing to bid for a stallion service fee must contact Patrick Clancy at the TBV Office on (03) 9258 4233 or tbv@racingvictoria.net.au. Bidding will close at 5.00pm on Monday, 2nd November (Melb Cup Eve). This auction follows the initiative lead by Moe’s Gelagotis brothers to offer their star horse Mourinho by way of an auction to an owner-for-the-day for last Saturday’s Cox Plate. They were generously supported by the Cup Club, Inglis and Moonee Valley Race Club. 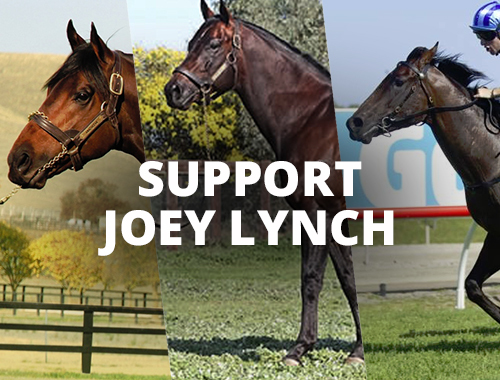 For further information about Joey Lynch’s courageous campaign visit www.supportjoey.com.au. Victorian breeder Micheal Ryan and Romsey based Supreme Thoroughbreds are living the dream with G1 Victorian Derby (2500m) prospect Get The Picture. After a couple of impressive black type runs at Moonee Valley and Caulfield, the Victorian-bred colt has been priced as the $9 second-favourite in TAB pre-post markets for the $1.5 million classic at Flemington this Saturday. “We’re really excited for Michael – he was one of our first clients when we opened the farm,” Supreme part-owner Neil Shaw said. Get The Picture (Excellent Art) is still in his first preparation and won a Ballarat maiden over 1600m in September prior to finishing second in the G2 Stutt Stakes (1600m) at Moonee Valley and fourth in the G3 Caulfield Classic (2000m). Ryan chipped in with a late-entry fee to run at Caulfield and the colt paid it back when flying home from last at the half-mile. 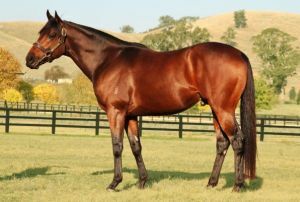 Get The Picture’s dam Classic Jewel (Rubiton) won twice around the Victorian provincials wearing Ryan’s lime and blue colours and, at stud, she has produced long-distance winners by Delago Brom, Delzao and Barton Gate. “The mare wasn’t covered by any ‘name’ stallions early in her career but she does throw cracking foals,” Shaw revealed. “Michael decided to go up market after Get The Picture was Group 2 placed and we rang Swettenham Stud to book into Toronado. He was as good as full but they squeezed her in. Toronado is a Group 1 winning son of High Chaparral and Supreme Thoroughbreds added a winning link to the former Coolmore Stud champion when Chevauchee won on debut at Kenilworth on Saturday. Chevauchee (3f High Chaparral – Chevaleresse by Danehill) made $50,000 out of the Supreme draft at the 2013 Melbourne Premier Sale. The Romsey nursery was also in spotlight at the South African Ready To Run Sale last week when its Myboycharlie – Nervate (More Than Ready) filly topped the leader-board at R2 million (AUD 202,545). They sold her for $30,000 at the 2013 Inglis Classic yearling sale. Sydney trainer Gai Waterhouse took time out last week to look at yearlings catalogued for the 2016 Magic Millions Gold Coast Yearling Sale ‏while down here for the Melbourne Spring Carnival. The leading trainer visited several of our leading nurseries including Musk Creek Farm, Tarcoola Stud, Lauriston Thoroughbreds and Ampulla Lodge (following a recent visit to Rosemont Stud). 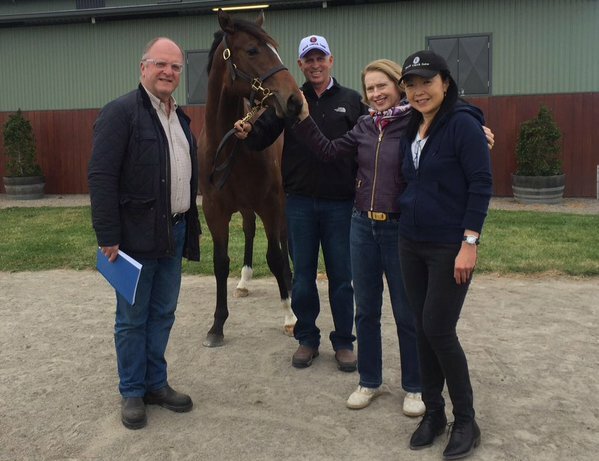 “It was a super day inspecting some impressive yearlings,” Gai said. Musk Creek’s yearlings would have been especially interesting during her stopover on the Mornington peninsula. The farm’s owner David Kobritz sold Pierro to Gai for $230,000 as a yearling and he went on to sweep the Sydney 2YO Triple Crown and is now standing at Coolmore Stud for a $77,000 service fee. Kobritz went back and pin-hooked a Pierro – Sorority Girl colt for $240,000 from Buckley-based Erinvale Thoroughbreds at the Magic Millions National Sale in May. Reward For Effort colt Dalradian has kicked off the $5 million Inglis Race Series with a brilliant victory on Cox Plate day at Moonee Valley. The Darren Weir trained youngster had scored on debut at Bendigo and followed up with a fighting win over Valliano (by Equiano) in the RL Inglis Banner (1000m). Dalradian (2c Reward For Effort – Miss Ireland by O’Reilly) was bred and sold by Chatswood Stud for $55,000 at the 2015 Inglis Melbourne Premier yearling sale. He races for a syndicate managed by David Speechley (also a part owner of Trust in a Gust) and has already earned $189,800 boosted by $41,300 in Inglis and VOBIS bonuses. “I don’t train many two-year-olds but this boy is the real deal,” Weir said. 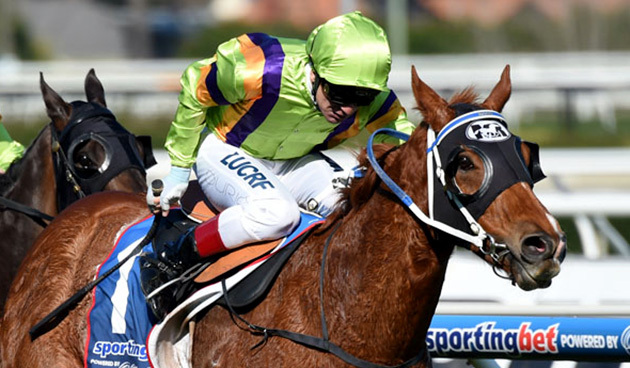 “He’s tough, too and there will be no problem backing up in the Maribyrnong Plate at Flemington. Reward For Effort launched his stud career winning the Victorian freshman title and Dalradian sent him to the top of this season’s Australian 2YO premiership after the lucrative result on Saturday. This is the Champion Victorian freshman sire’s third stakes winner for the season – making him the only second season sire around Australia currently to record have multiple stakes winners. Dalradian is from an unraced half-sister to stakes performers Launfal (HK) and Azure (NZ). Chatswood Stud owner Greg Willis has an Anacheeva half-sister to the Inglis Banner winner at Seymour but Miss Ireland failed to get in foal to the Caulfield Guineas winner last year. Reward For Effort (Exceed And Excel) has averaged over 160 mares in his first four books and he stands for an $11,000 (inc gst) fee at Chatswood Stud. 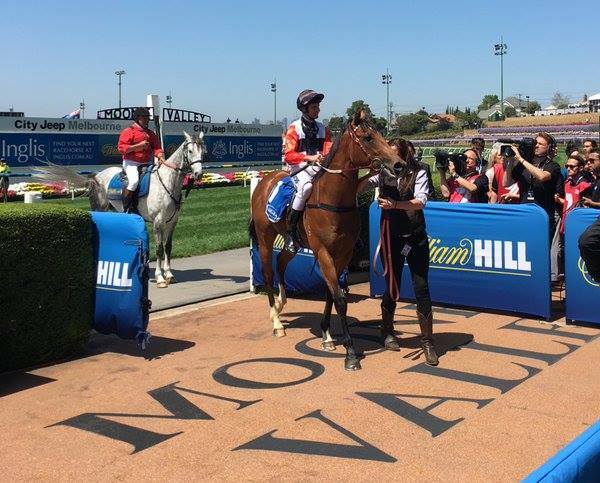 TBV member Lynne Alderson sold her promising homebred My Poppette earlier this season but she cheered the filly to victory in the G2 Moonee Valley Fillies Classic (1600m) on Saturday. Lynne bred My Poppette and she was a family favourite winning the LR Anzac Day Stakes at Flemington in April for trainers Colin (Lynne’s husband) and Cindy Alderson (daughter). They accepted an offer from new owners Rob and Donna Love in the off-season and the filly now races in their distinctive colours of red and white hearts. The Snippetson filly controlled proceedings in front and then increased the tempo to trounce her rivals by almost three lengths at the Cox Plate meeting. “We didn’t think she was ready for the Thousand Guineas and this race looked perfect,” trainer Robert Smerdon said. My Poppette is from Brompton’s Choice (Runyon) who is a half-sister to the dam of Neo (G2 Wellington Guineas). Other close relations include Brompton Cross (G2 Edward Manifold Stakes) and her son Delago Brom (G1 Australian Guineas). Lynne has retained a Dalakhani – Brompton’s Choice yearling colt and the mare is due to foal to Magnus early in November. She won’t be bred back this year. Trainer Ciaron Maher won last year’s G1 VRC Oaks with the Victorian bred Set Square (by Reset) and is confident he can make it two in a row with Jameka. Bred by Gilgai Farm owner Rick Jamieson, she’s right in contention to double up for the stable after beating the colts in the G2 Moonee Valley Vase (2040m) on Saturday. She ran down Shards and then firmed into a $4 second-favourite behind Sacred Eye ($2.90) for their classic clash on November 5. Maher said Jameka was similar to Set Square at the same stage of their careers. “Jameka improved to be placed in the Thousand Guineas and looked better again today. She seems to be coming together nicely and will be peaking next time. Jameka (Myboycharlie) cost $130,000 from the Gilgai Farm consignment at the 2014 Inglis Melbourne Premier yearling sale. Her dam Mine Game (General Nediym) is a Melbourne winning half-sister to G1 Canterbury Guineas winner Jymcarew. Jameka rises to the occasion on the big days – her only other win in 8 starts was the G2 Victorian Sires’ Produce Stakes in March. Jamieson has been walking on air around Nagambie since his mare Helsinge foaled a fantastic looking half-sister to Black Caviar by Blue Gum sire Canford Cliffs last week. Victorian breeder Lyn Eastman is looking forward to this Friday’s Moonee Valley meeting with her last-start winner Patche Gift. The Darren Weir trained sprinter looked a city-class horse in the Warburton Carriers Plate (975m) at Swan Hill last week. He was disappointed for a rails run in the straight but recovered to salute by a half-length with apprentice Jye McNeil on board. Patche Gift is a son of former Swettenham Stud sire Dash For Cash and had finished fourth at his only other outing in May. “It was a real good win first-up and we will take him straight to Melbourne. 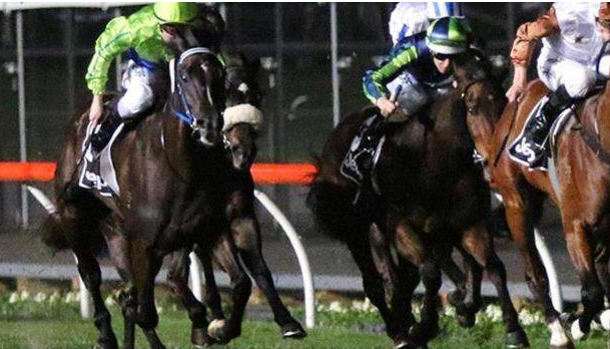 There’s a race on Friday night that should suit.” Weir’s racing manager Jeremy Rogers said. Weir races Patche Gift under the Forest Lodge stable-banner in partnership with Lyn and her husband Larry and fellow breeder Neville Dewhurst. Larry is best known in victorian harness racing circles and currently trains the impressive Menin Gate, Australia’s champion three year old last season. The North West Victorian based breeders also have Patche Gift’s 2yo sister by Dash For Cash. 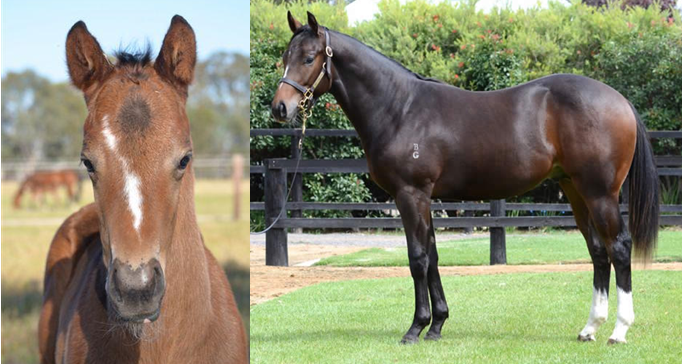 They are the only two foals from Northwood Lass (Dolphin Street) who won 3 races up to 2100m in Victoria. She was bred by Seymour couple Barrie and Midge Griffiths and is related to their Caulfield Cup winner Mannerism. Weir continued his winning run with Victorian bred gallopers at Moonee Valley last Friday when Lucky Paddy claimed the Johnnie Walker Country Cup (1600m). A son of former Blue Gum Farm stallion Churchill Downs, he sold for $15,000 out of the Bombora Downs draft at the 2013 Inglis VOBIS yearling sale. 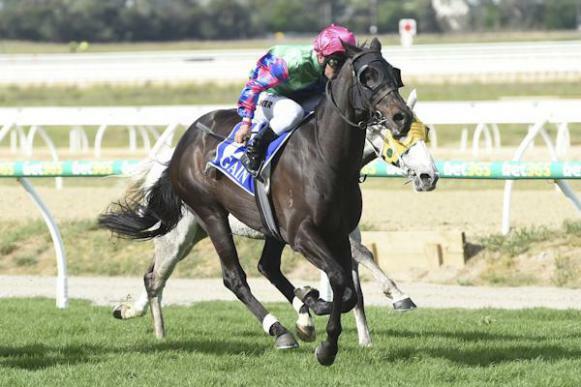 Desert King sired stayer Rainbow Storm won his second country feature event this month with a blistering turn of foot in the Hamilton Cup (2200m) on Sunday. The Darren Weir trained gelding was coming off a Murtoa Cup victory on October 3 and bolted in by four lengths from Red Fella (Keep The Faith) and Letmedowngently (Musee D’orsay). The Victorian bred trio scooped the $60,000 prizemoney on offer at Hamilton. Rainbow Storm (5g Desert King – She’s Timid by Almaarad) was bred by the late Worrall Dunn who was named TBV Small Breeder of the Year in 2014. His most successful horse was She’s Archie who gave Weir his first Group 1 in the 2002 South Australian Oaks. The Archway mare also finished second to Makybe Diva in the 2003 Melbourne Cup. Rainbow Storm is from a sister to the dam of She’s Archie. She’s Archie’s daughter May’s Dream (New Approach) gave Dunn a posthumous Group 1 in the South Australian Oaks last year. 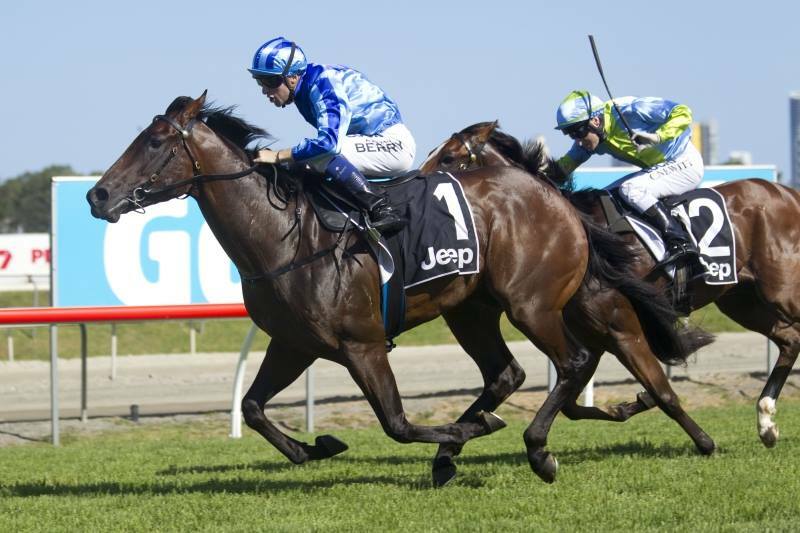 May’s Dream is expected to line up in the Group 1 Myer Classic on Derby Day this Saturday. Horsham based, Dunn’s wife Lorraine and their daughters Celeste, Melissa and Simone have several horses in work with Weir. “The Dunn family have had horses with me since I first got my trainer’s licence,” he said. Desert King (Danzig) is best known as the sire of Melbourne Cup legend Makybe Diva and Group 1 weight-for-age star Desert War. His G2 Perth Cup winner Real Love is back in work for another summer carnival campaign and she was successful in a Lark Hill trial last week. LP Stallions manager Julie Nairn stands Desert King in association with Lauriston Park studmaster Chris Bakker for a $6,600 (inc gst) fee. For further details, contact Nairn on 0402 901 910 or Bakker on 0427 903 353. A new Master of the ‘Valley? 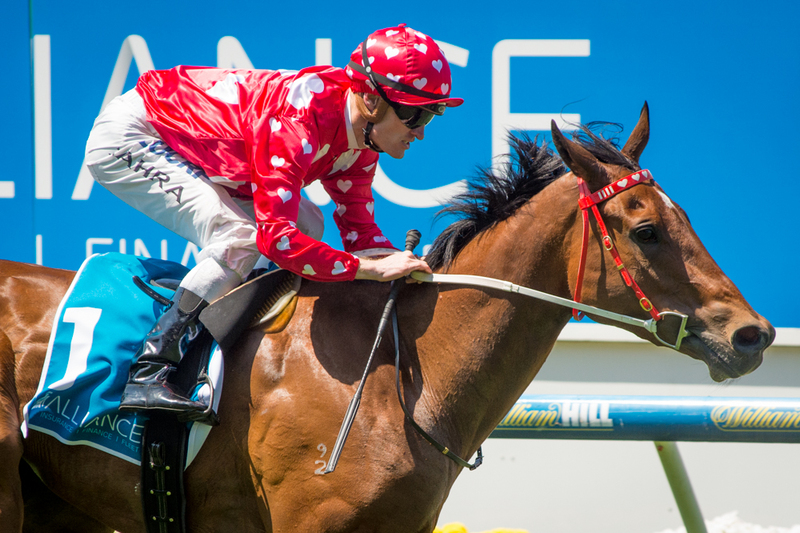 The Inglis Banner at Moonee Valley on Cox Plate Day for the two-year-olds has some exciting Victorian bred juveniles lining up for a crack at a big prize. Ten of the fourteen runners are Victorian bred or sired and will be running not just for the $250,000 in prizemoney but also a lucrative $30,000 in Super VOBIS bonuses. Young Mornington trainer Amy Johnston is confident of her entry, Delta D’Or, in the race. Like many of the runners, the Master of Design gelding is a debutant. 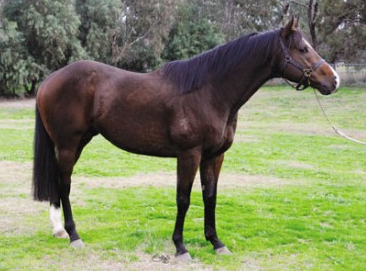 Delta D’Or was bred by the late Kevin Heffernan and raised at Blue Gum Farm. He is out of the Encosta De Lago mare Gold Delta who is a sibling of black type winners Gold in Dubai and Gold Busker. Amy bought Delta D’Or as a yearling for $30,000 in conjunction with David Raphael’s Stallion Racing at the Inglis VOBIS Gold sale in April. “David picked him out and we bought him together with a couple of other fellas,” Amy said. Following a gallop by Delta D’Or at Moonee Valley’s annual Breakfast with the Best on Tuesday morning, Amy said she was really pleased with his work. “We weren’t going out there to break any track records. It was just nice confident work going into Saturday. His jockey for Saturday, Stephen Baster, also rode him on Tuesday morning and was happy with the horse’s work. “He has had a jump out at Balnarring, I rode him there and trialled quite nice. Delta D’Or will be one of two runners in the Inglis Banner for Swettenham Stud’s sire Master of Design. The other is Kinetic Design which was stakes placed at Flemington in the Maribyrnong Trial Stakes earlier this month. Other Victorian sires represented in the race include Reward for Effort (Dalradian), Equiano (Valliano), Red Arrow (Le Meringue) and Stryker (Preemptive) while former Victorian sires Host (Rata Tat Tat) and Bel Esprit (Sweet Sherry) also have a runner each. Emphatically (bred by Lauriston Thoroughbreds) and Credible Witness (Ed McKeon) were also bred in Victoria and will be eligible for the Super VOBIS bonuses. Full field here on Racing.com. 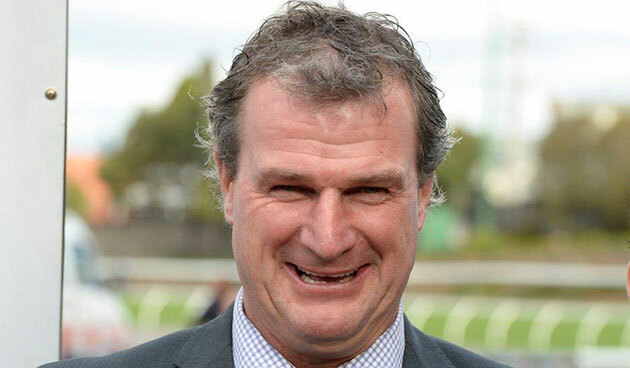 Flemington trainer Nigel Blackiston has been patience personified with Victorian bred Desert Jeuney and the rejuvenated galloper paid him back with interest on Thursday. Desert Jeuney won the $120,000 Moe Cup (2000m) which was renamed the Browns Sawdust & Shavings Cup after being transferred to Pakenham. It broke a long run of outs going back two years. The son of Lauriston Park sire Desert King (Ire) showed talent from his first gallop and won a Pakenham maiden as a summer three year-old before progressing to complete a hat-trick at Morphettville, Sandown and Flemington later that season. Nick-named ‘DJ’, he travelled to Sydney as an autumn four year-old and earned minor black-type in the G3 Sky High Stakes (1900m) at Rosehill prior signing off with a midfield finish in the G1 Sydney Cup (3200m). “He came back for last year’s spring carnival and gave us a great thrill with placings in the G1 Toorak and G2 Crystal Mile,” Blackiston recalled. The challenges didn’t stop there for Blackiston. “He returned to racing in August but was fractious in the barriers first-up at Flemington and missed the start hopelessly. After some re-education, we added pacifiers but then he refused to compete at Caulfield – perhaps he was ‘pacified’ too much according to Glyn Schofield. “Then we went back to basics with beach work and some subtle changes in his routine. It started to pay dividends when he was fourth in the Gold Nugget at Ballarat and the JRA Cup at Moonee Valley. “The return of Michael Walker was also significant. He had won twice on DJ previously and knew the horse well. He warned the owners before the Cup at Pakenham that he wouldn’t allow the horse to see daylight at the last possible moment. And Michael ride to that plan perfectly! Desert Jeuney (6g Desert King – Preps by Jeune) cost $16,000 at the 2011 Melbourne Autumn yearling sale and has earned $321,035. His breeder John Schembri has sent Preps back to Desert King this year. Desert King (Danzig) is known the world over thanks to Melbourne Cup legend Makybe Diva and other Group 1 winner. His long list of country cup winning progeny continues to grow with last-start Murtoa Cup winner Rainbow Storm attempting to double up in the Hamilton Cup next weekend. Strong results were gained among the Victorian sired lots at the recent Magic Millions 2YO Sale on the Gold Coast. A total of 16 Victorian sires were represented at the sale with three such lots attracting amongst the highest prices. Eliza Park’s Wanted had two lots in the top ten of the sale. His colt from Gal Express (Success Express) was purchased by Singapore trainer Theo Keiser for $170,000 while the filly out of Belleluia (Bel Esprit) will stay in Queensland after making $160,000 to the bid of Australasian Thoroughbreds director Jamie Bourke. Wanted (Group 1 winning son of Fastnet Rock) stands at Eliza Park International and his $170,000 colt was bred by the O’Brien family’s Lauriston Thoroughbreds at Corinella. He was sold for $35,000 as a yearling and is a half-brother to Timely Truce (Brief Truce) who was stakes-placed as a juvenile at Caulfield and Flemington. Wanted (Fastnet Rock) won a G1 Newmarket Hcp (defeating Starspangledbanner) and he stands for a $16,500 (inc gst) fee at Eliza Park International. A Reward For Effort filly out of Canny Lad mare Gender Bender sold for $152,500 after posting the third fastest breeze up of the sale. 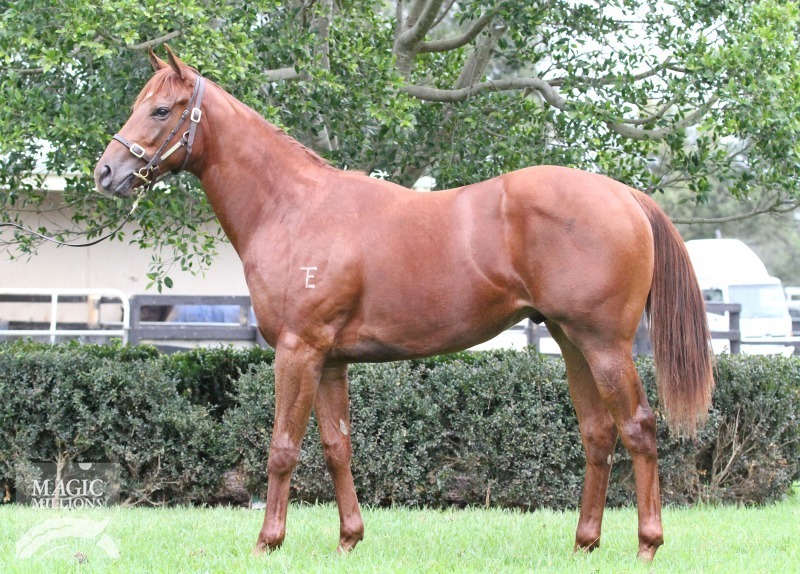 Extraordinarily, the two year old filly was purchased for just $1,500 at the Magic Millions National Yearling Sale earlier this year. There is no doubt the performances of the progeny of the Chatswood Stud sire over recent months, including multiple black-type victories, contributed to the enormous profit for the yearling buyer. Chatswood Stud stands Reward for Effort (Exceed And Excel) for an $11,000 (inc gst) service fee. Other Victorian sired lots to obtain strong results above the sale average included those by Darley Victoria’s Helmet and Hard Spun, Three Bridges’ Stryker and Eliza Park’s Magnus and Bel Esprit. It was a big week for progeny of Swettenham Stud sire with big results in the United Kingdom, Australia and a first winner in Hong Kong. Equiano colt Dancing Flames launched his Hong Kong career with an awesome debut in the Chuen Lung Rst Hcp (1000m) at Sha Tin. The Danny Shum trained speed machine overcame a tricky inside gate to clock 56.51s down the straight course on Sunday. He jumped straight to the front under Chad Schofield and then proceeded to dominate the season’s first race restricted to three-year-olds. “He’s a star,” Shum said after the win. Swettenham Stud shuttler Equiano (Fr) sired the exciting prospect from Contract Racing’s broodmare Allegretto (Anabaa). She is a sister to Hong Kong Group 3 winner High Intelligent and a half-sister to G2 Emancipation Stakes winner Hec Of A Party (Hector Protector). Allegretto foaled a Helmet colt in August and she has been tested in foal to Swettenham Stud’s new Group 1 sire Toronado (Ire). Dancing Flames was originally named Equita in Australia and was trained by Brent Stanley after he purchased the colt at the Inglis Premier Sale. Equita won a Cranbourne trial in April before his connections accepted a bid on behalf of owner Tam Chau. “Chad’s father Glyn Schofield advised us to buy the horse,” Shum recalled. 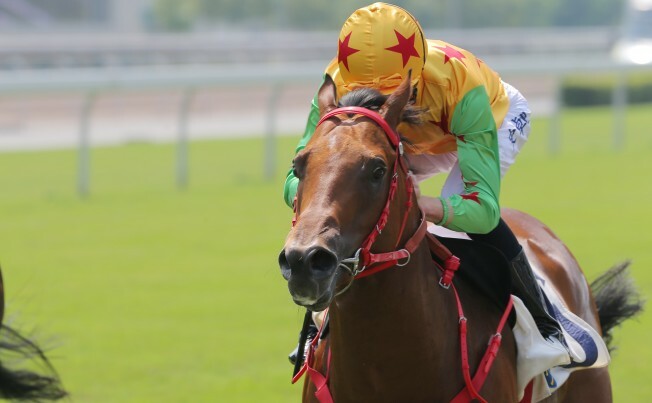 The Hong Kong victory completed an outstanding week for Equiano. In England, he started with two winners at Chelmsford and Nottingham, had a yearling filly sell for 130,000gns (AUD 285,550) at the Tattersalls October Sale and his classy three year-old The Tin Man ran a cracking fourth against older horses in the G1 British Champions Sprint (1200m) at Ascot on Saturday. Closer to home, Equiano’s record-breaking sales colt Kerauno bolted in when making his debut on Friday. Trainer Mick Price will bring the $420,000 Inglis Premier graduate to town after that eye-catching victory at Donald. Talented Stryker filly Andrioli launched the Caulfield Cup meeting on a winning note for Peter Carrick’s Lakeview Resources and Three Bridges Thoroughbreds on Saturday. Andrioli scored a front-running victory in the $100,000 Yellowglen Plate (1400m) and, with a big Super VOBIS bonus, she collected $81,000 for first place. Carrick purchased her on behalf of a syndicate for $65,000 at the 2014 Inglis Melbourne Premier Sale and sent the filly to Caulfield trainer Robert Smerdon. “She looked good in the yard and Robert didn’t tie me down with too many instructions,” jockey Craig Williams said. “She was drawn wide and I decided to make a beeline for the front. The Melbourne businessman, who raced top sprinter Kaphero, boards his mares at Arcadia on the Goulbourn Valley Hwy between Nagambie and Shepparton. Andrioli had opened her account at Sandown Lakeside earlier this year and also finished fourth in the G3 TBV Stakes at Flemington in March. 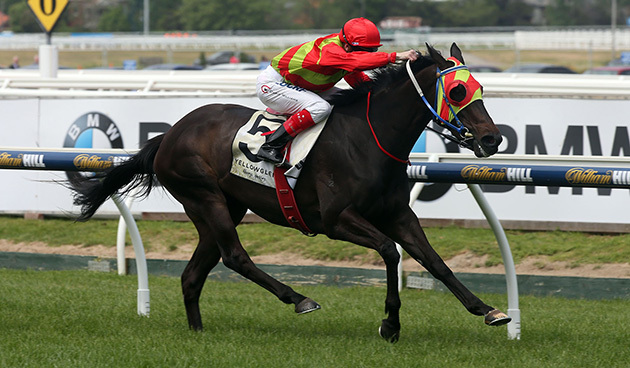 She will be set for the LR Desirable Stakes (1400m) at Flemington’s Melbourne Cup meeting on November 3. Bred and sold by Three Bridges Thoroughbreds, she is by resident sire Stryker from G2 Reisling Slipper Stakes winner Let’s Rock Again (Chief’s Crown). Stryker stands for an $11,000 (inc gst) fee at Three Bridges. His promising Kiwi three year-old Rangipo won again in Rotorua on Saturday after breaking his maiden at Taupo last month. Contract Racing sprinter Flamberge has spearheaded a Victorian-bred trifecta in the LR Durbridge Stakes (1200m) at Morphettville. Flamberge is a homebred for David and Jenny Moodie and returned to Adelaide for the first time since his G1 Goodwood victory in May. The son of Exceed And Excel started a $1.25 favourite in Saturday’s weight-for-age contest and scored by a half-length from front-runner Swinging Arms (Planchet) and Mandla (Bel Esprit). In two starts at Moonee Valley since resuming from a winter spell, he had been runner-up to Chautauqua in the G2 McEwen Stakes and was a close-up sixth in the G1 Moir Stakes. 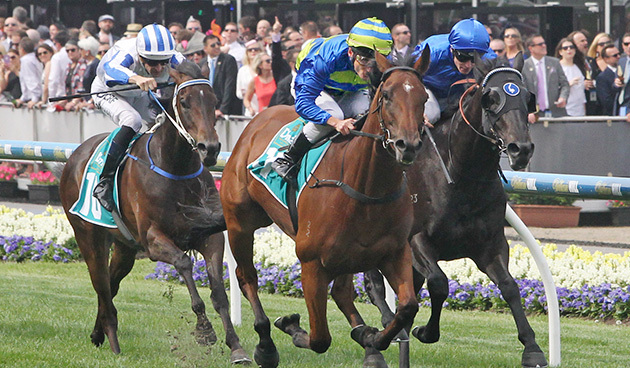 “He closed really well in a hot race behind Buffering last time,” jockey Vlad Duric said. Flamberge is from multiple stakes winner Razor Blade (Blazing Sword). The Contract Racing mare has previously foaled Flemington stakes winners Curtana (Exceed And Excel) and Sunburnt Land (Scenic). 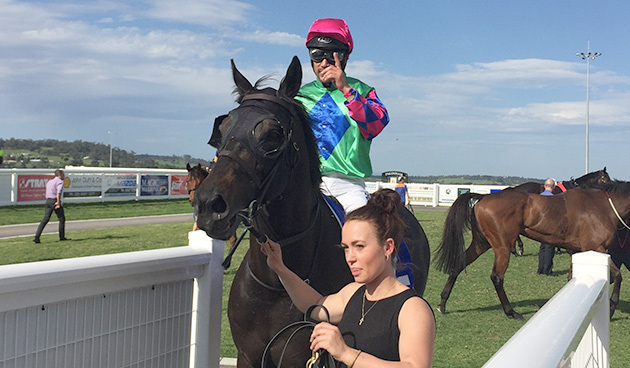 Her four year-old Durendal (Medaglia D’Oro) saluted second time out this season at Pakenham on Friday. He had won a Moe maiden this time last year and then doubled up at Caulfield in May before earning black-type on a hit-and-run visit to Doomben. Blue Gum Farm shuttler Canford Cliffs sired his 29th individual juvenile winner in Europe this year when Wimpole Hall was successful in England on Thursday. 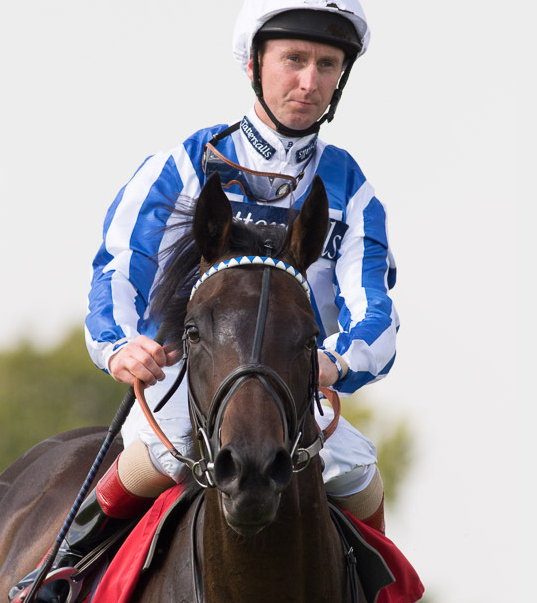 Wimpole Hall (2c Canford Cliffs – Sparkling Eyes by Lujain) had been placed in previous starts at Newmarket and Epsom and was the top-rated runner in the Tote Exacta Maiden Stakes (1200m) at Chelmsford. The colt was a 65,000gns (AUD 126,240) buy at the 2014 Tattersalls October yearling sale and is a half-brother to winners by Piccolo and Royal Applause. “He had some useful form in the book and I had been pleased with him at home,” trainer William Jarvis said. Canford Cliffs (Ire) is chasing the record for the most winners by a first-season stallion in Europe. Iffraaj set the current mark in 2010 when he sired 38 individual winners. In Australia, Canford Cliffs has his first-crop two year-olds primed for the season ahead and Nagambie breeder Rick Jamieson reports he sired a “gorgeous” half-sister to Black Caviar at Gilgai Farm last week. Blue Gum Farm stands Canford Cliffs for a fee of $13,750 (inc gst). Astronomer Royal filly Stellar Path matched her G3 Prix des Reservoirs win at Deauville in 2013 with another victory at that level in New York on Saturday. 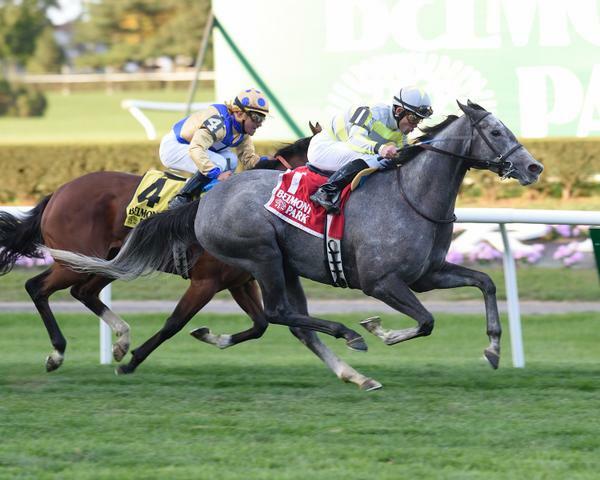 Stellar Path (4f Astronomer Royal – America Nova by Verglas) crossed the Atlantic earlier this year and improved her career card to 7 wins in 18 starts in the G3 Athenia Stakes (1700m) on turf at Belmont Park. Angled off the fence by Joel Rosario, she found space in the straight to outlast longshot Wiener Valkyrie and Group 2 winner Lady Lara. Stellar Path was purchased by her new owners for 380,000 euros (AUD 557,555) at the 2014 Arqana December Sale. Like her older brother Weary, she was bred in France by Australian-operated agency SF Bloodstock. Weary had been exported to Australia a year earlier to win the G2 Expressway Stakes and G3 Doncaster Prelude. He is raced by Geoff and Mary Grimish after changing hands for 145,000 euros (AUD 208,450) at the 2013 Arqana October Sale. Astronomer Royal (Danzig) won the 2007 French 2000 Guineas and was also placed in that year’s French Derby. He initially shuttled to Blue Gum Farm and Eliza Park International before relocating to Riverbank Farm in Benalla earlier this year. Studmaster Russell Osborne stands Astronomer Royal for a $4,400 (inc gst) service fee. 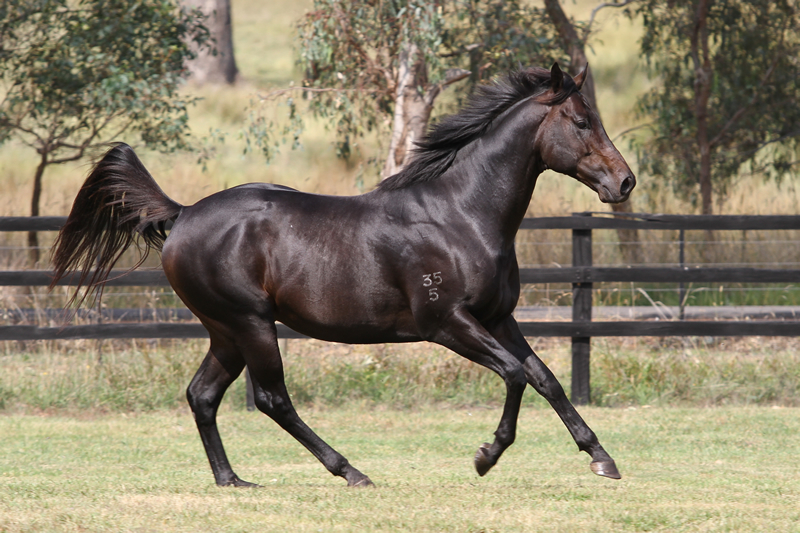 New Victorian sire Rock Hero is off and running at Lauriston Park at Creighton ‘s Creek. The imposing son of Fastnet Rock has already covered just short of 40 mares with an outstanding fertility rate in excess of 90%. That is great news for Lauriston and Rock Hero’s supporters who have been sending him mare from across the state and beyond. “I am rapt with how Rock Hero is working,” said the stud’s Chris Bakker. An imposing bay with outstanding natural ability, Rock Hero had an explosive turn of foot which was seen when he charged home from well back to take out the Listed Dulcify Quality. So highly regarded was Rock Hero that Payne at one stage rated him more promising than his then stablemate Criterion. Watch this clip to hear the respected trainer discuss Rock Hero’s talent. Already letting down after enjoying a few months at Lauriston leading to the breeding season, Rock Hero is impressing all who visit. Rock Hero’s dam, the high class Gallant Tess, is booked back into Snitzel having recently foaled a “cracking” filly by him. Meanwhile her All Too Hard yearling filly is looking the goods whilst her Redoute’s Choice two-year-old Typhoon Tess is showing excellent ability for the David Payne stable. Intersted breeders can also inspect Rock Hero online at this clip. 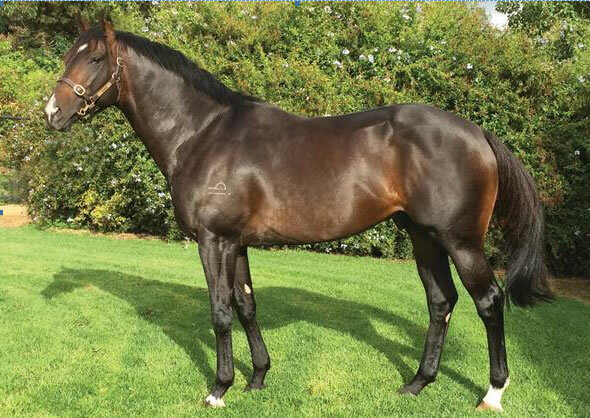 Larneuk Stud’s emerging stallion O’Lonhro, the record-breaking Chelmsford Stakes winner, was represented by a trio of promising winners over recent days. Kicking off the winning run was Larneuk’s own Brightly Goes who was so dominant breaking her maiden at Echuca on Monday last week. A short priced favourite on the back of an eye-catching first up second behind the smart Northern Model, the Phil Sweeney trained mare showed her usual pace to share the lead with two others before taking over with 100m to go and finding the line in determined fashion. “When you ask her for her effort she really fights,” said jockey Brooke Sweeney. 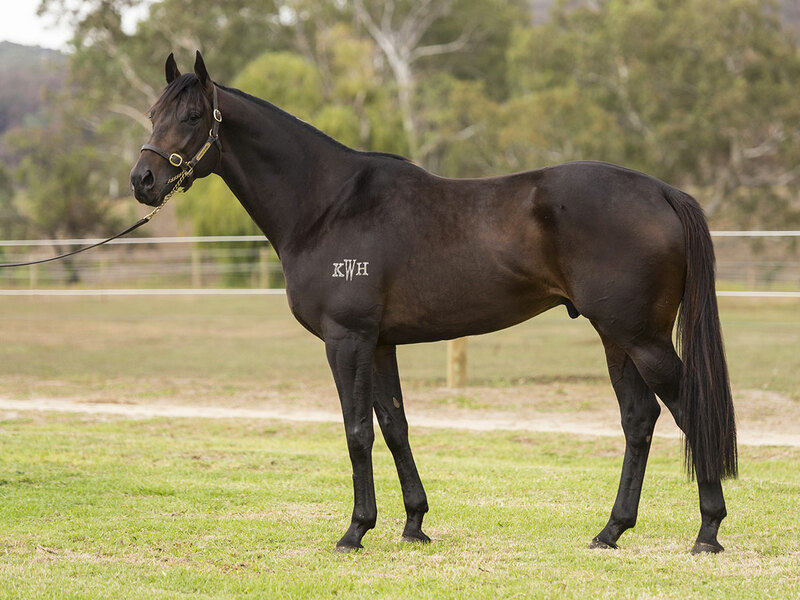 That willingness to find the line is a trait well known in the Lonhro breed and O’Lonhro is also passing it on – as well as speed with all three of his winners last week leading throughout. The second of which was the Larneuk Stud bred, Darren Weir trained Social Media who found the line extremely well at Hamilton last Friday – despite things not going to plan! After jumping well from an inside gate, Social Media’s jockey Dean Yendall lost an iron and the horse took charge – going out strongly in front and pressured throughout but still had a length on her rivals on the line. “She is a talented mare and it was a strong win after she nearly took off on Dean!” said managing owner Darren Dance. To the Gold Coast on Saturday where Je Suis Prest impressed – burning across from an outside gate to take the lead, skipping clear from the turn, saluting by 2 1/4 lengths eased down. “She’s a tough little mare,” a delighted Brad Herne said. “I really like these O’Lonhro’s,” the trainer continued. “From what I’ve seen they all seem to be tough with a great will to win and I wouldn’t complain if I had a stable full of them. For further information on O’Lonhro who stands this spring at a great value fee of $5500 (incl gst) contact Neville Murdoch on 0418 105 706.